Grammar nerds, brace yourself for a dose of funny. Oh, what a world of difference an apostrophe makes. 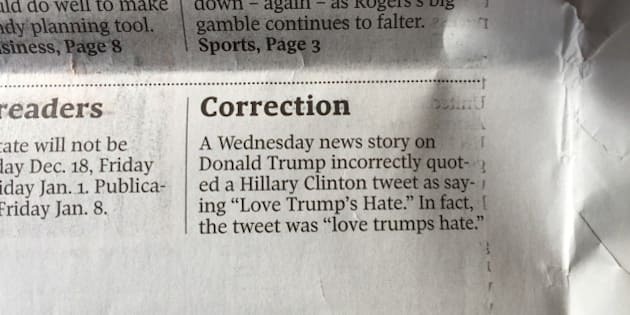 For readers who peered into their copies of The Globe and Mail on Friday, some may have noticed a brief note owning up to an error made two days earlier. The original Globe and Mail article, written by the newspaper’s Washington-based correspondent Paul Koring, was published Wednesday and also ran online. The report quoted Hillary Clinton after she tweeted “Love trumps hate” on Tuesday. She did so in response to Republican presidential nomination candidate Donald Trump’s proposal to ban all Muslims from entering the United States. The slogan is part of a new sticker campaign to galvanize support and donations to boost Clinton’s bid for the Democratic Party presidential nomination. The Globe’s digital version of the article has since been updated to note the correction.